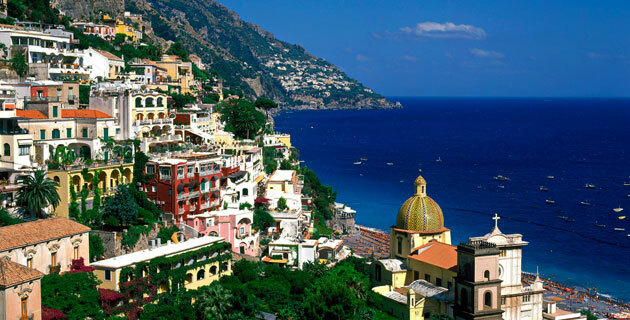 From the breathtaking Amalfi Coast to eternal Rome, through the gentle Umbrian and Tuscan countryside to timeless Venice, this wide-ranging tour showcases ancient sites, contemporary life, priceless art, and beautiful natural scenery. You’ll especially appreciate the small size of your group as you stay in unique accommodations in the Tuscan countryside and in a medieval village. Standing amongst orchards of citrus trees and floral gardens, the contemporary Hotel San Francesco overlooks the longest beachfront stretch of the Amalfi coast. The 44-room hotel features restaurant and bar, safe deposit box, internet access, laundry and dry cleaning services, and private beach. Each air-conditioned guest room offers a private terrace and has a private bath with hair dryer, mini-bar, TV, and phone. A well-located hotel just a two-minute walk from the Via Veneto, the 110-room Empire Palace is an actual palace, built in 1870 and completely refurbished and converted to a hotel that offers a restaurant and bar, fitness center, Internet access, and laundry service and dry cleaning services. Air-conditioned rooms feature private bath with hair dryer, in-room safe, mini-bar, TV, and phone. Please note that because of the unique nature of this hotel, room sizes vary. Located in Orvieto’s medieval town center, this refurbished 19th-century building with hanging gardens is close to some of Orvieto’s key points of interest, including the Palazzo del Popolo, Moro Tower, and the Duomo. The intimate 46-room hotel also features a bar, rooftop terrace, library, internet access, and laundry service. Air-conditioned guest rooms have private bath with hair dryer, in-room safe, TV, and phone. Located within the Chianti Hills surrounded by vineyards and olive groves, this 18th-century antique villa is a family-run country retreat, part of the Italian tradition of agriturismo, the preservation of rural ways of life. The 21-room Villa San Filippo features a Tuscan-style dining area and bar, walking gardens, safe-deposit boxes, laundry and dry cleaning services, internet access, and outdoor pool. Each air-conditioned room includes private bathroom with hair dryer, TV, and phone. There are no elevators. Please note that because of the unique nature of this family residence, room sizes vary. Opened in August 2012, the contemporary Carnival Palace overlooks the Cannaregio Canal in the heart of historic downtown Venice. Along with a garden and waterfront terrace bar, the 67-room hotel offers Internet access and laundry service. Guest rooms have Venetian furnishings, private bath with hair dryer, mini-bar, in-room safe, TV, and phone. Enjoy time on your own in this most timeless of cities. Extension not available on May 14, May 28, and Jun 4 departures. Italians themselves love this guide to the Italian character, which addresses their never-ending passion for beauty, disorder and high emotion. Severgnini opens the book with a snapshot of the hubbub at Malpensa Airport, then moves on to Tuscany, Rome, Naples and Sardinia. A terrific collection of some of the best literary writing on Italy, including pieces by Melville, Lawrence, Henry James, Mary McCarthy and many others. Another gem in the Eyewitness series, this superb guide is handsome, convenient and up-to-date. Featuring color photography, dozens of excellent local maps and a region-by-region synopsis of the country’s attractions. A convenient laminated map of Italy at a scale of 1:800,000 with excellent topographic detail, an index and large maps of Sicily and Sardinia. A colorful, detailed city map of Venice, perfect for finding your way around the famously labyrinthine streets and canals. A compact, illustrated guide in the popular series, featuring favorite attractions in Venice. The second edition of Morelli’s expert survey of handcrafted Italian shops and products from Murano glass to ceramics, jewelry and leather. A vivid tour of the city and its riches by the fine biographer of Edith Wharton and Henry James. Lewis has written what he calls “a partial biography of Florence,” beautifully interweaving the personal and the historical. A brief history of Italy through the 1990s – wide-ranging, accessible and necessarily condensed. With a useful chronology and historical gazetteer, this book marches confidently through the centuries. Elegantly written, generous and informative, this compact book takes in the sweep of Italian history from the Roman Republic through the Renaissance, World War II and up to the present. Italy correspondent for The Economist Hooper explores Italy – its baffling contradictions, unique character and contemporary culture – in this illuminating portrait. Roger Crowley spins tales of three centuries of plunder and plague, imperial conquest and piracy in this riveting new history, chronicling the transformation of a tiny city of lagoon dwellers into the richest place on earth. Presented with flair and backed by a wealth of research, King’s captivating chronicle of Michelangelo’s painting on the ceiling of the Sistine Chapel tells the story of its conception and creation. This indispensable pocket guide illustrates daily life in the city as revealed by its evocative frescoes, mosaics and treasures. A classic, illustrated survey of the world of the Renaissance and its art. With chapters on Florence and its artists, the Netherlands, early illustrated books and many individual artists. This engaging overview of the history of the Colosseum deconstructs Hollywood-perpetrated misconceptions of gladiator-eating lions, Nero fiddling and other myths. Grizzuti Harrison writes with warmth and depth of her journey from Milan south to Calabria in this sprightly account of Italy and the Italians. Assisi wandered for 20 years, affording Newsweek editor Francke and her patient husband plenty to see and do in the piazzas, sanctuaries and chapels of Assisi, Siena, Bologna, Venice, Gubbio, Rome and other choice spots. Morris displays her talent for research, telling anecdote and well-wrought prose in this spirited portrait of a beloved city, its history and inhabitants. If you are going to read one book on Venice, we recommend this favorite. The first of the tremendously good Guido Brunetti mysteries, all set in the author’s beloved Venice, in which a famous conductor is found dead at the celebrated La Fenice theater. Time travel into an ancient past through this fascinating chronicle of an imagined 24 hours in the life of a Roman patrician, when Imperial Rome is at the pinnacle of its power.